For other uses, see Valkyrie (disambiguation). 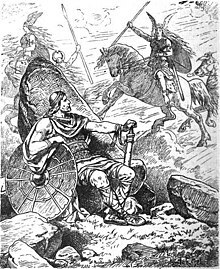 In the poem Grímnismál, Odin (disguised as Grímnir), tortured, starved and thirsty, tells the young Agnar that he wishes that the valkyries Hrist ("shaker") and Mist ("cloud") would "bear him a [drinking] horn", then provides a list of 11 more valkyries who he says "bear ale to the einherjar"; Skeggjöld ("axe-age"), Skögul, Hildr, Þrúðr ("power"), Hlökk ("noise", or "battle"), Herfjötur ("host-fetter"), Göll ("tumult"), Geirahöð ("spear-fight"), Randgríð ("shield-truce"), Ráðgríð ("council-truce") and Reginleif ("power-truce"). After stanza 18, a prose narrative relates that Helgi and his immense fleet of ships are heading to Frekastein, but encounter a great storm. Lightning strikes one of the ships. The fleet sees nine valkyries flying through the air, among whom they recognise Sigrún. The storm abates, and the fleets arrive safely at land. 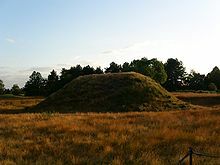 Helgi dies in battle, yet returns to visit Sigrún from Valhalla once in a burial mound, and at the end of the poem, a prose epilogue explains that Sigrún later dies of grief. 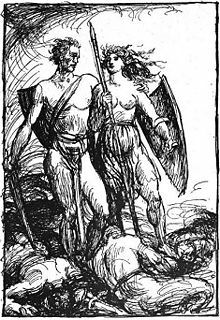 The epilogue details that "there was a belief in the pagan religion, which we now reckon [is] an old wives' tale, that people could be reincarnated" and that "Helgi and Sigrun were thought to have been reborn" as another Helgi and valkyrie couple; Helgi as Helgi Haddingjaskaði and Sigrún as the daughter of Halfdan; the valkyrie Kára. The epilogue details that further information about the two can be found in the (now lost) work Káruljóð. 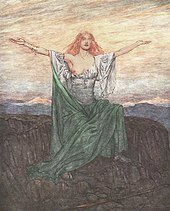 The valkyrie Sigrdrífa says a pagan Norse prayer in Sigrdrífumál. 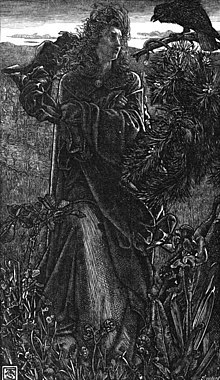 Illustration (1911) by Arthur Rackham. In chapter 31, poetic terms for referring to a woman are given, including "[a] woman is also referred to in terms of all Asyniur or valkyries or norns or dísir". In chapter 41, while the hero Sigurd is riding his horse Grani, he encounters a building on a mountain. Within this building Sigurd finds a sleeping woman wearing a helmet and a coat of mail. Sigurd cuts the mail from her, and she awakes. She tells him her name is Hildr, and "she is known as Brynhildr, and was a valkyrie". Jacob Grimm states that, though the norns and valkyries are similar in nature, there is a fundamental difference between the two. Grimm states that a dís can be both norn and a valkyrie, "but their functions are separate and usually the persons. 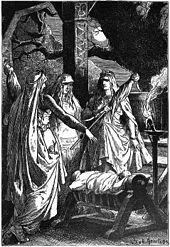 The norns have to pronounce the fatum [fate], they sit on their chairs, or they roam through the country among mortals, fastening their threads. Nowhere is it said that they ride. The valkyrs ride to war, decide the issues of fighting, and conduct the fallen to heaven; their riding is like that of heroes and gods". Various theories have been proposed about the origins and development of the valkyries from Germanic paganism to later Norse mythology. 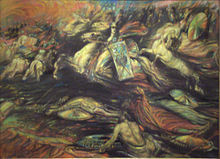 Rudolf Simek suggests valkyries were probably originally viewed as "demons of the dead to whom warriors slain on the battlefield belonged", and that a shift in interpretation of the valkyries may have occurred "when the concept of Valhalla changed from a battlefield to a warrior's paradise". Simek says that this original concept was "superseded by the shield girls—Irish female warriors who lived on like the einherjar in Valhall." 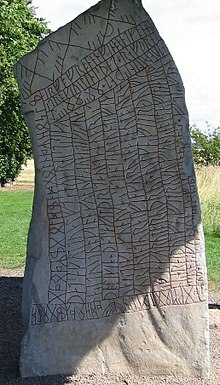 Simek says that the valkyries were closely associated with Odin, and that this connection existed in an earlier role as "demons of death". Simek states that due to the shift of concept, the valkyries became popular figures in heroic poetry, and during this transition were stripped of their "demonic characteristics and became more human, and therefore become capable of falling in love with mortals [...]." Simek says that the majority of the names of the valkyries point to a warlike function, that most of valkyrie names do not appear to be very old, and that the names "mostly come from poetic creativity rather than from real folk-belief." 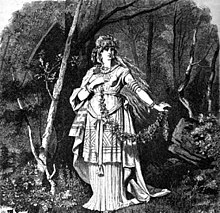 MacLeod and Mees theorise that "the role of the corpse-choosing valkyries became increasingly confused in later Norse mythology with that of the Norns, the supernatural females responsible for determining human destiny [...]." Davidson places emphasis on the fact that valkyrie literally means "chooser of the slain". She compares Wulfstan's mention of a "chooser of the slain" in his Sermo Lupi ad Anglos sermon, which appears among "a blacklist of sinners, witches and evildoers", to "all the other classes whom he [Wulfstan] mentions", and concludes as those "are human ones, it seems unlikely that he has introduced mythological figures as well." Davidson points out that Arab traveller Ibn Fadlan's detailed account of a 10th-century Rus ship funeral on the Volga River features an "old Hunnish woman, massive and grim to look upon" (who Fadlan refers to as the "Angel of Death") who organises the killing of the slave girl, and has two other women with her that Fadlan refers to as her daughters. Davidson says that "it would hardly be surprising if strange legends grew up about such women, who must have been kept apart from their kind due to their gruesome duties. Since it was often decided by lot which prisoners should be killed, the idea that the god "chose" his victims, through the instrument of the priestesses, must have been a familiar one, apart from the obvious assumption that some were chosen to fall in war." Davidson says that it appears that from "early times" the Germanic peoples "believed in fierce female spirits doing the command of the war god, stirring up disorder, taking part in battle, seizing and perhaps devouring the slain." 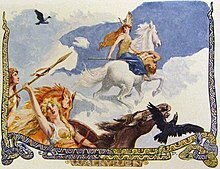 Valkyries have been the subjects of various poems, works of art and musical works. 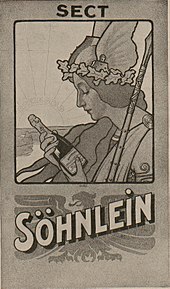 In poetry, valkyries appear in "Die Walküren" by H. Heine (appearing in Romanzero, 1847), "Die Walküren" (1864) by H. v. Linge, and "Sköldmon" (appearing in Gömda Land, 1904). 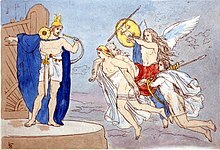 In music, they appear in Die Walküre by Richard Wagner (1870), from which the "Ride of the Valkyries" is the most well known theme. 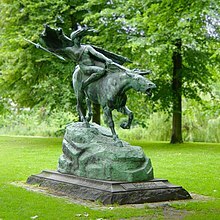 Wikimedia Commons has media related to Valkyries. This page was last edited on 18 March 2019, at 19:00 (UTC).